I agree. I think the German vowel in aber is open, unlike the not-fully-open [ɐ] of STRUT, and is backer than cardinal 4 [a] but fronter than cardinal 5 [ɑ]: in fact, just about halfway between cardinal 4 [a] and cardinal 5 [ɑ]. 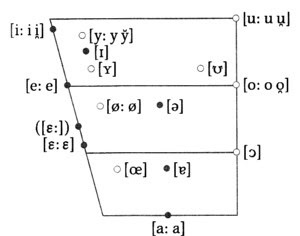 Here is Mangold’s vowel chart for the oral monophthongs of Standard German (Dudenaussprachewörterbuch6, p. 37). Some people want the IPA to approve the use of small-cap [A] for this quality. I do not favour this proposal, because no language as far as I am aware distinguishes three fully open unrounded vowels, [a] vs. [A] vs. [ɑ]. Just as the symbol [t] has to represent sounds that may be aspirated or unaspirated, dental or alveolar, according to the language, so we must demand flexibility in vowel symbols such as [a]. If it is essential to symbolize the central quality explicitly, then we have diacritics available: [ä] or [ɐ̞] or [ɑ̈]. But it’s better to state such details once and for all in the transcriptional conventions, not repeatedly in a transcribed text. Would you say German long /aː/ and short /a/ have the same quality? I can't quite decide - sometimes I think they do, and sometimes I think short /a/ is just a teeny bit fronter than long /aː/. I find it fascinating that this is a sound that isn't deemed worthy of a cardinal's mitre, and one isn't sure even how to write it, and yet it's probably the most widespread vowel, occuring in most European languages and the sound babies worldwide start with. Just as the symbol [t] has to represent sounds that may be aspirated or unaspirated, dental or alveolar, according to the language, so we must demand flexibility in vowel symbols such as [a]. Well, there is a diacritic that means "aspirated" (and even one, from the extension of IPA for pathology, for "unaspirated"); there are diacritics for "apico-dental", "laminal" and "apico-alveolar"*; but while there are diacritics for "centralized" and "lowered", there are none for "central" or "low". Would you say German long /aː/ and short /a/ have the same quality? This depends on regional variation even within Standard German. For me (Austrian) they do have the same quality (making them the only case in the vowel system where two phonemes differ by length alone), and both are front (can be as front as in French, though they don't always fully reach it), but in much of Germany one is front and the other is central or perhaps back, with regional variation in which is which. and sometimes I think short /a/ is just a teeny bit fronter than long /aː/. Well, actually, this does sometimes happen to me, I think. Still far from the central vowel which I know from Mandarin, though. Oops, please disregard the asterisk. I wanted to start a distracting ramble about the postalveolar plosives of Australian Aboriginal languages, but thought better of it. I've seen this symbol used so often without any transcription convention as a central low vowel that has virtually assumed a dual personality. It's original use in the Daniel Jones cardinal vowel set, is very front and sounds just like [æ]. It makes me often wonder if there's really much difference between this c.[a] and [æ] which is the lowest frontest vowel I can produce, anyway. What I see in many internet based IPA maps with clickable sound file demonstrations is the adoption of the symbol as a central vowel sound without any diacritics. I would favour redeploying the symbol as a central vowel since it's use as such is already entrenched in the English diphthong system with diphthongs like /aɪ/ which is nothing like [æɪ], unless you're from Australia! Generally it's a central low vowel start for most varieties of English. The same goes for /aʊ/. Why not rename the cardinal vowel represented by /a/ as /A/ or even [æ] since it sounds as close to that as much as [uː] and [iː] do to their respective cardinals. Then let /a/ follow it's calling, it's eternal destiny as a low central vowel!